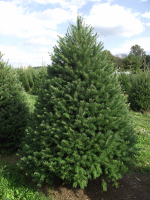 The Frazier Fir is the most popular tree we sell. It is predominately grown in the Southeastern United States. This tree is very full that give off a good aroma. The branches are firm and good for hanging ornaments. The Balsam Fir is the second most popular tree. They are mainly grown in Canada. They give off a good aroma. It is not very full and has strong branches which is why its considered the best for hanging ornaments. The Douglas Fir is the most locally grown tree we sell. These trees give off the best or strongest aroma. They tend to be extremely full in size. The branches are flimsy which makes it the most difficult to hang ornaments.